Christiane's site had been set up in a way where every time she added a product to her store, she would have to manually add it to one of her shop pages as well. With Squarespace there is no need to add extra work like this. The original home page was a cover page that showed some of her beautiful work. We changed the home page to show off more of her work and have more text for SEO purposes. We showed her categories of work here as well to make it easy for viewers to find what they are looking for easily and visually. 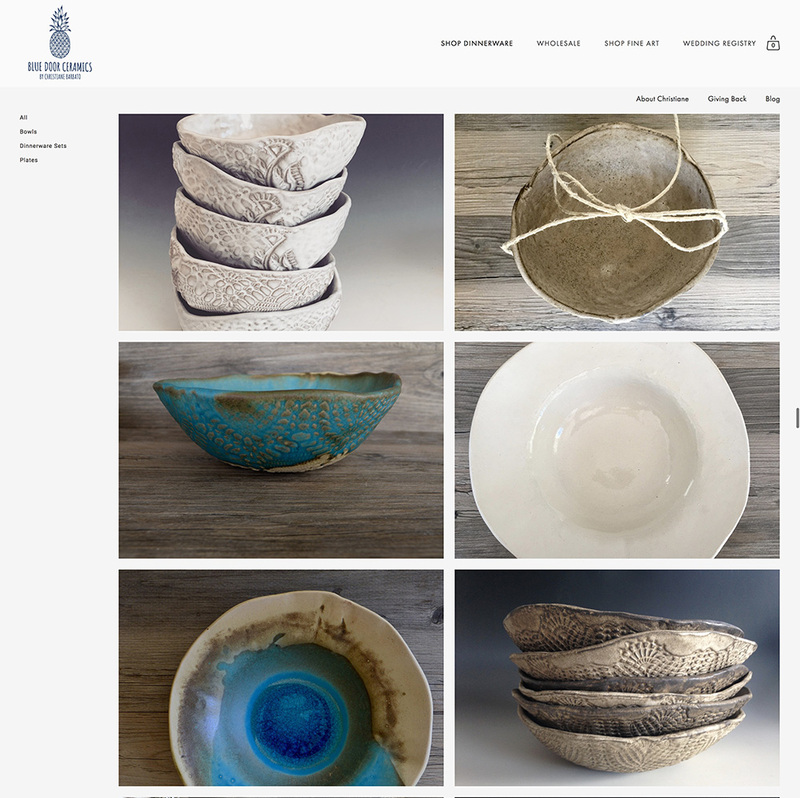 We created unique shops for her ceramics and her fine art and used categories to make it easy for her customers to find what they are looking for. We also separated out her wedding registry to highlight that in an easy to find way. Using the category tags on your Squarespace ecommerce shop is a great way to create an easy to use experience for your customer. I changed the header area to have 2 distinct areas. This is possible using any of the Brine family templates in Squarespace. The primary navigation area contains everything to do with the shop in order to highlight that and make it easy for her customers to shop. Since this is the main focus of her website we wanted to change the site to reflect this. The secondary navigation now contains links to her about page and blog and other pages that are not focused on the shop. The previous header had too many options and made it confusing to find anything. A new streamlined navigation area makes it easy to find stores and information quickly. Are you looking for a redesign of you site? Contact me regarding a website fixer upper!